Sir Winston Churchill was the Prime Minister of the United Kingdom from 1940 to 1945, and again from 1951 to 1955, and is best known for his leadership of the UK during World War II. Coming from a military dynasty, Churchill was a many of many strengths and talents – from a noted statesman and orator, to a historian and a Nobel-prize winning writer – and during his time as an officer in the British Army, Churchill saw combat in India, Sudan and the 2nd Boer War, as well as serving briefly on the Western Front during World War I. Before becoming Prime Minister, he held many political positions, including the President of the Board of Trade, Home Secretary, Secretary of State for War and the Chancellor of the Exchequer. 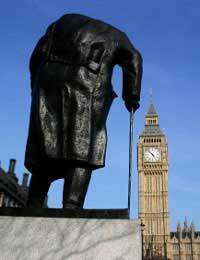 Ultimately, he led Britain to victory against the Germans and other Axis powers and through his famous speeches, became an inspiration to the British people and the embattled Allied forces. Mao Zedong was a Chinese political and military leader who led the Communist Party of China to victory in the Chinese Civil War and formed the People’s Republic of China, of which he was the leader until his death in 1976. Although a controversial figure, even to this day, he is named as one of the 100 most influential people of the 20th century by Time Magazine and is certainly one of the most important figures in world history. In mainland China, he remains venerated and portrayed as a great revolutionary who transformed China into a major world power through his policies – despite the fact that these same socio-political programmes (such as the “Cultural Revolution” and the “Great Leap Forward”) caused severe damage to the society, economy, culture and foreign relations of China, not to mention a death toll in the tens of millions. For this reason, Mao has many critics both within and outside China. As the notorious leader of the Nazi Party, there are few who do not know of Hitler – the Chancellor of Germany from 1933 to 1945 and the ‘Führer und Reichskanzler’ of Germany from 1934–1945. Hitler used charisma, propaganda and his gift of oratory to gain support by promoting nationalism, anti-semitism and anti-communism – and his Nazi party executed or assassinated many of his opponents, enabling him to restructure the state economy, rearme the armed forces and establish a totalitarian and fascist dictatorship. His actions, in particular the German invasion of Poland in 1939, led to the outbreak of World War II in Europe. Hitler’s thirst for territorial conquest and racial subjugation caused the deaths of 43 million people, including the systematic genocide of an estimated six million Jews plus other "undesirable" populations – a terrible tragedy in what became known as the Holocaust. Joseph Stalin was the party leader and dictator of the Soviet Union, under a regime now known as Stalinism which included forced rapid industrialization of the largely rural country and collective farming by confiscating the lands of farmers. Under his rule, millions were killed, exiled to Siberia, or died of starvation when their land, homes, possessions, and ability to earn an existence were taken to fulfil Stalin's vision of massive "factory farms". Although his policies resulted in the Soviet Union being transformed from an agrarian economy to a major industrial powerhouse in a short span of time, millions of people died as a result of the economic upheaval and political policies, such as the “Great Purge” when all those who were suspected of a threat to Soviet politics were executed or exiled to Gulag labour camps in remote areas of Siberia or Central Asia, where many more died of disease, malnutrition and exposure. Despite all this, the Soviet Union under Stalin also made the largest and most decisive contribution to the defeat of Nazi Germany during World War II. Often known as “FDR”, Roosevelt was the 32nd president of the United States of America and is the only US president to have served more than two terms (he served four in total). A leader who believed in democratic ideals, he was a central figure during a time of worldwide economic crisis and world war. He created great reforms to provide relief during the Great Depression of the 1930’s and one of his most important legacies in the US is the Social Security system. During World War II, he made the US the principal arms supplier and financier of the Allied forces, while also helping vast expansion of industry in America, the achievement of full employment, and new opportunities opened for African-Americans and women. At the close of the 2nd World War, Roosevelt played a critical role in shaping the post-war world, such as through the creation of the United Nations. He remains the touchstone for modern American liberalism.